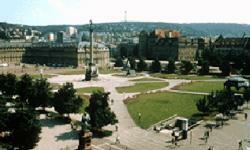 A city of just over half a million inhabitants Stuttgart is also the capital of Baden-Württemberg, one of the 17 Bundesländer Germany is divided into. The city center is quite beautiful, with a mixture of old and new buildings and sites and it is particularly good for shopping, too. Have a look at our main shopping street, the Königsstraße. This picture was taken from the tower of the main station. In summer the central square called Schlossplatz is a perfect place to be out and about, to relax from a shopping tour and experience the real Stuttgart life - more or less 24 hours a day! Football fans like Oliver are regular visitors to the Gottlieb-Daimler stadium, which hosts one of the top German football teams and hence attracts thousands of visitors each week. 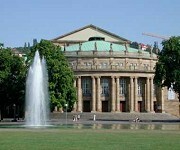 But it is not only used for sports: major open air concerts make famous highlights in the Stuttgart night life! 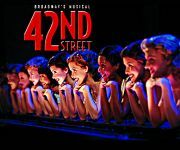 If you prefer musicals make sure you visit the SI Centre which features "42nd Street" at present - tap dance at it's best! The famous Stuttgart Ballet and one of the best German opera houses can be found in our city, too - why not chose this alternative to the usual cinema? 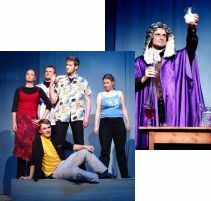 From time to time our students organize their own event, for example a party to celebrate the end of term or, like on Wednesday 16 June, a theatre project reviewing the course of chemistry over the past few thousand years. Texts, songs, lyrics, stage set-up - all had been done by students only and an enormous success rewarded their year-long effort! 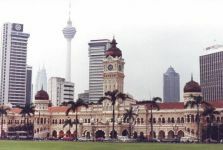 Looking at the famous temple area of Kuala Lumpur there are some distinct differences between our two countries and home towns - but it is pretty obvious that there is not so much of a difference between young people all around the world! 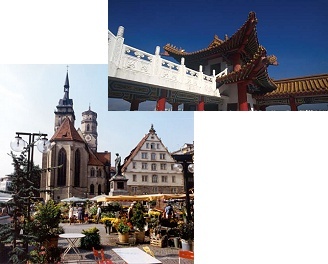 It would be great if we could one day visit Malaysia and meet the TDH Stars personally - and we would very much enjoy to show our Malaysian partners around Stuttgart!